* These statistics do not include the final play of the first half, because it wasn’t a true drive/scoring attempt (although Lorenzo Ward came surprisingly close to turning it into one). Those first five categories are the “Five Factors”, which I’ve written about before. This season, I’ll be tabulating them on a game-by-game basis (at least for SoCon matchups). It is not easy to win games with an offensive Success Rate south of 30%. As a comparison, in 2016 the Bulldogs had a Success Rate in league play of 45.4%. The lack of efficiency is reflected in the abysmal third down conversion rate and the Bulldogs’ yards per play numbers. Wofford wasn’t much better, thanks to an extended run of stops by the Bulldogs that began midway through the second quarter and continued until the end of the third period. At one point, the Terriers ran 19 offensive plays, only one of which could have been considered successful. The coaching staff should be credited with several excellent in-game adjustments, including a three-man front and a lot of shifting prior to the snap (which reminded me of what UNC did to the Bulldogs in Chapel Hill two seasons ago). However, before then the Terriers had already created multiple “explosive” plays (two of which went for TDs). Wofford came close to doubling up the Bulldogs in yards per play. Why was this game close, then? Well, turnovers had a lot to do with it, obviously, but The Citadel also had a significant edge in field position, thanks mostly to a fine display of punting by freshman Matthew Campbell. In something of an ironic twist, arguably the only one of Campbell’s eight punts that wasn’t stellar ended up being his most beneficial, as the football bounced off an unsuspecting Terrier and into the grateful arms of Keyonte Sessions. That recovery set up the tying touchdown. Those were his first seven throws. All of them came in “passing down” situations. Brent Thompson mentioned in his Tuesday press conference that in hindsight, he wished there had been more “shots down the field”. I’m assuming he meant throwing on first down, or perhaps in 2nd-and-short (or 3rd-and-short) situations, downs in which a pass wouldn’t be an obvious call. I would also add that The Citadel shouldn’t wait to throw until the offense is in good field position. For example, I wouldn’t mind throwing down the field even while inside the Bulldogs’ own 30-yard line. Black has demonstrated in the past that he can throw the football with accuracy; I would like to see him get a chance to do so in better down-and-distance circumstances. I’m not an advocate of throwing more often, but I do think The Citadel needs a higher percentage of its passes to come on “standard” downs, rather than passing downs. One way to do that, as I’ve mentioned before, is to have a more aggressive fourth-down mentality, which gives a playcaller more “wiggle room”. – Speaking of fourth down, the Bulldogs were 4 for 6 converting those downs against Wofford. I agreed with all six decisions to go for it. I actually think there should have been a seventh, late in the second quarter on 4th-and-4 from the Wofford 40-yard line. Thompson elected to punt, which struck me as a bit conservative. However, that decision was ultimately rewarded by a questionable playcall from the Terriers. I am not sure why, up 21-0 late in the first half and getting the ball to start the third quarter, Wofford’s coaching staff thought passing from the Terriers’ own 14-yard line was a good idea. Well, it was a good idea from Noah Dawkins’ point of view, anyway. – Much of the teeth-gnashing in the stands on the visitors’ side came from watching the Bulldogs try to tackle. That has to improve against Chattanooga, and every game going forward. – I didn’t have any major issues with the late-game time management decisions (and I can be a very tough grader in that area). The way I look at it is this: The Citadel had not had a sustained offensive drive during the entire game prior to the last possession. The Bulldogs basically had to ham-and-egg their way down the field to even get a chance at a tying touchdown. Given that, I am satisfied with four shots from the five-yard line, whatever it took to get there. The Citadel had to throw on the first three downs because of its lack of timeouts, but I couldn’t find any real fault with how the timeouts had been employed (maybe Thompson could have called the first one on the play before he wound up using it, but that was marginal). I’ve seen suggestions that The Citadel could have run the ball towards the sideline and gone out of bounds if it didn’t result in a TD, but I’m dubious that would have worked, especially as Wofford would have likely anticipated a boundary rush. The only down that a run was even close to a feasible percentage play was the last one, and even then you’re talking about five yards. Hey, they had four tries. It just didn’t work out. – That was probably the last time Miles Brown will play against The Citadel (unless the two teams meet again in the FCS playoffs). He has been one of the best opposition players the Bulldogs have faced in the last few years of SoCon action. Brown’s stats might be relatively modest (as is often the case for a nosetackle), but there is no doubting his impact on the game. – I mentioned this on Twitter, but I wanted to reiterate how impressed I was with the Aron Spann fan club. That was quite a turnout. I wish I had been more impressed with the P.A. announcer, who kept pronouncing Spann’s last name as “Spahn” for some reason. C’mon, he’s local and went to Dorman High School. You’ve got to get that right. – Another thing Wofford needs to get right is its concessions situation. This was a significant problem two years ago when The Citadel played at Gibbs Stadium, and it was a problem again on Saturday. Long lines snaked around the area behind the visitors’ stands, as fans waited in the heat to make their respective orders. Apparently, things were just as bad on the home side. 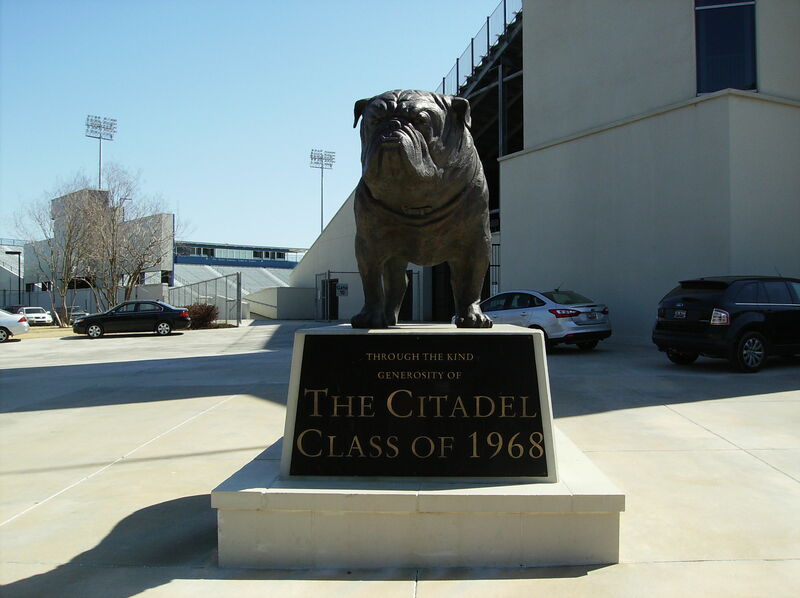 By this time, the folks running the gameday setup at Wofford have to know that The Citadel is going to bring a big crowd (game attendance: 8,930, which included a lot of folks clad in light blue). I really wish Wofford had not allowed them to bring their entire corps of cadets up to the game…it’s supposed to be a home field advantage! You have to admit, limiting the number of opposing fans would probably solve the issues Wofford has with concessions. Could help with parking, too. Let’s all agree not to tell him that only about one-fourth of the Corps was actually at the game, though. – Next for the Bulldogs: the home opener, against Chattanooga. I’ll write something about that game later in the week. The pictures are always bad. These, however, are particularly lousy (and are not annotated). I did not take many game shots after the first quarter, partly because my cellphone battery got a little low, and partly because the sun made taking pictures on the visitors’ side a challenge. I’ll try to do better next week on the photo front, but no one should get their hopes up. This isn’t going to be a long review (and it is late, for reasons not having anything to do with the game itself). Nevertheless, I wanted to make a few quick observations. – The Citadel threw 13 passes in the first half — six in the first quarter, and seven in the second quarter. The Bulldogs completed five of their first six throws, but were only 1-for-7 in the second quarter. I wasn’t really sure why The Citadel threw so often in the first half. Later in the game, sure, but it seemed to me that the Bulldogs got out of their natural offensive rhythm. I realize much of the passing was based on what Mercer’s defense was doing, but I still thought it was odd. – The two-deep for Saturday’s game included ten freshmen on offense (five starters) and seven on defense. The Bulldogs also featured a freshman punter and numerous other first-year players on all the special teams units. It showed at times, particularly on offense. The Bulldogs may be better later in the season once this group of players has more experience, but that fact may be hard for some supporters to accept. Just a different game plan. We ran a lot more zone options last week (at Samford). This week, it was more operational, and Dom was operating just fine. We had to move pretty quickly, because (Mercer’s defense) was moving around quite a bit, and one quarterback seems to suit me better with all those moving parts. I don’t have a problem with that decision. Allen certainly wasn’t making bad plays. The only real reason to change QBs in that situation is if you think just making a switch could spark the team, and Thompson clearly didn’t believe that. However, I wish Thompson could have gone into the stands during one of the media timeouts and explained the situation to the fan behind me who yelled “Put in Black!” at least 300 times during the game. – The officials didn’t decide the game, but they weren’t in good form, either, unless you enjoy the art of haphazard ball-spotting. The SoCon crew seemed to delight in delaying the game for instant replay reviews whenever possible (one reason the contest took 3:21 to play), but there was somehow no review of a punt that hit a Mercer gunner in the back on a would-be return. You would have thought so, but nope. The Citadel’s Logan Bailey came out of the pile with the football. The referee looked at him — and then awarded possession to Mercer. I guess that play wasn’t worth a review. Maybe the wrong team recovered the football. – It was one of the muggier days at Johnson Hagood Stadium in recent memory, which made the length of the game all the more arduous. The announced attendance was disappointing (9,969), which was due to a lot of factors, including the heat (I’m sure a significant number of people with tickets wound up not going to the game). This is just a theory of mine, but I believe one thing that will improve attendance is a permanent seating structure on the East side. That isn’t going to be around again until at least the 2019 season, of course. This week’s pictures aren’t half-bad, at least compared to most weeks. They are currently not annotated (I may go back and do that later). They are in order, however, so anyone trying to piece together plays/results can use the play-by-play from the box score to match things up (at least through most of the first three quarters).